D.F. Duncan Sr. was the co-patent holder of a four-wheel hydraulic automobile brake and the marketer of the first successful parking meter. He was also the genius behind the first premium incentive where you sent in two cereal box tops and received a toy rocket ship. However, Duncan is best known for being responsible for promoting the first great yo-yo fad in the United States. Duncan was not the inventor of the yo-yo; they have been around for over twenty-five hundred years. In fact, the yo-yo or yoyo is considered the second oldest toy in history, the oldest being the doll. In ancient Greece, the toy was made of wood, metal and terra cotta. The Greeks decorated the two halves of the yo-yo with pictures of their gods. As a right of passage into adulthood Greek children often gave up their toys and placed them on the family altar to pay homage. Around 1800, the yo-yo moved into Europe from the Orient. The British called the yo-yo the bandalore, quiz, or the Prince of Wales toy. The French used the name incroyable or l'emigrette. However, it is a Tagalog word, the native language of the Philippines, and means "come back". In the Philippines, the yo-yo was used as a weapon for over 400 hundred years. Their version was large with sharp edges and studs and attached to thick twenty-foot ropes for flinging at enemies or prey. People in the United States started playing with the British bandalore or yo-yo in the 1860s. It was not until the 1920s that Americans first heard the word yo-yo. Pedro Flores, a Philippine immigrant, began manufacturing a toy labeled with that name. Flores became the first person to mass-produce toy yo-yos, at his small toy factory located in California. Duncan saw the Flores toy, liked it, bought the rights from Flores in 1929, and then trademarked the name Yo-Yo. Duncan's first contribution to yo-yo technology was the slip string, consisting of a sliding loop around the axle instead of a knot. With this revolutionary improvement, the yo-yo could do a trick called "sleep" for the first time. The original shape, first introduced to the United States was the imperial or standard shape. Duncan introduced the butterfly shape, a design that reverses the halves of a traditional imperial yo-yo. The butterfly allowed the player to catch the yoyo on the string easily, good for certain tricks. Donald Duncan also worked out a deal with the newspaper tycoon William Randolph Hearst to get free advertising in Heart's newspapers. In exchange, Duncan held competitions and the entrants were required to bring a number of new subscriptions for the newspaper as their entry fee. The first Duncan Yo-Yo was the O-Boy Yo-Yo Top, the toy with a big kick for all ages. Duncan's massive factory produced 3,600 of the toys every hour making the factory's hometown of Luck, Wisconsin the YoYo Capital of the World. Duncan's early media blitzes were so successful that in Philadelphia alone, three million units sold during a month-long campaign in 1931. In general, yo-yo sales went up and down as often as the toy. One story tells how after a market dip in the 1930's the Lego company was stuck with a huge inventory, they salvaged the unsold toys by sawing each yo-yo in half, using them as wheels on toy trucks and cars. Yo-yo sales reached its highest peak in 1962 when Duncan Yo-Yo sold 45 million units. Unfortunately, this 1962 hike in sales led to the end of Donald Duncan's Company. Advertising and production cost far outstripped even the sudden increase in sales revenues. Since 1936, Duncan experimented with parking meters as a sideline. Over the years, the parking meter division grew to become Duncan's main moneymaker. This and bankruptcy made it easier for Duncan to finally cut the strings and sell his interest in the yo-yo.The Flambeau Plastic Company bought the name Duncan and all the company's trademarks, they began producing their line of all plastic yo-yos soon after. 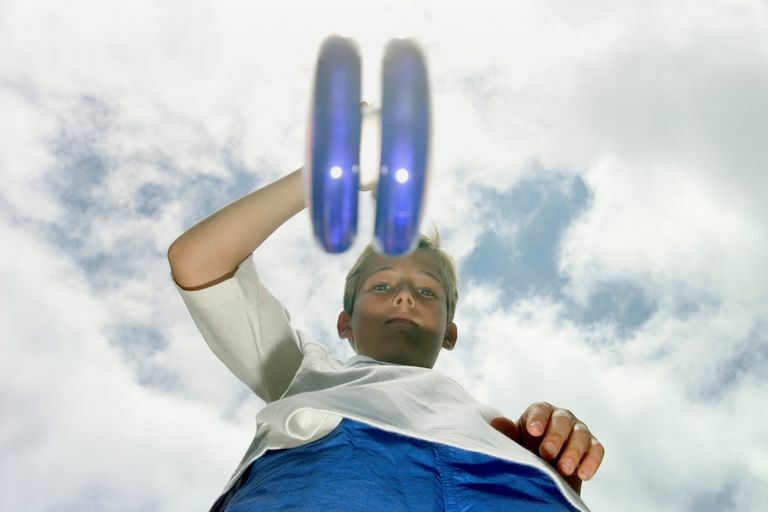 The yo-yo continues today, its latest honor is being the first toy in outer space. Where Did the Modem Come From? Just Whose Idea Was the Ugly Christmas Sweater?